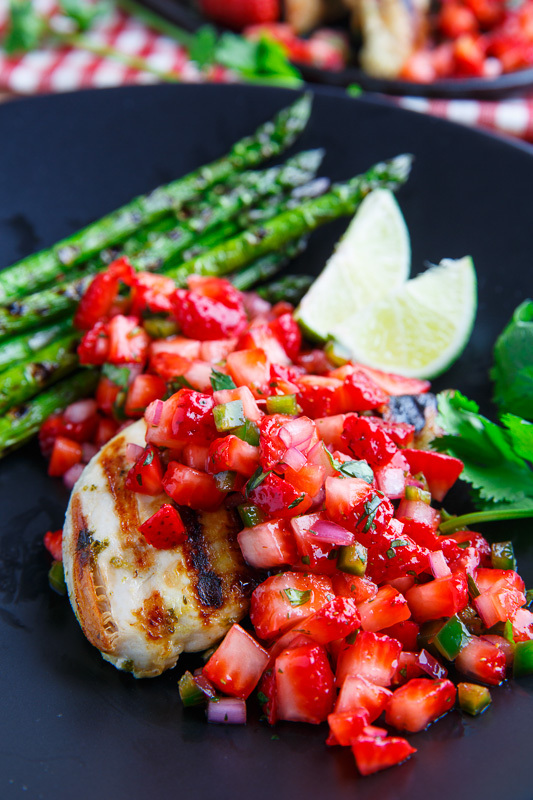 Tasty cilantro lime grilled chicken topped with a fresh, summery strawberry salsa. Please raise your hand if you saw this coming! Although the strawberry salsa and the cilantro lime grilled chicken that I recently shared are amazing by themselves, they are even better together! It’s really hard to beat a quick and easy meal consisting of a tasty grilled meat topped with a fresh fruit salsa and this one just screams summer! If you marinate the chicken and make the salsa the night before all you really need to do is head outside into the sunshine, fire up the grill and cook the chicken for a no fuss and no mess meal in the great outdoors, or just in your back yard, or on a balcony as the case may be. If you are looking for a nice way to celebrate the arrival of summer you can’t go wrong with this cilantro lime grilled chicken with strawberry salsa! Takes 60 min , serves 4.